Chief Minister Shivraj Singh Chouhan said that Madhya Pradesh has become the first state of the country to implement Forest Rights Act. As many as 2 lakh 25 thousand forest right pattas have already been given in the state to people dwelling in the forest. In Dindori itself, pattas of 23 thousand hectares land have been given to the people of scheduled tribe by conducting a special campaign. CM Chouhan mentioned that by passing a bill in the assembly, the state government has given 30 lakhs residential pattas to each needy people of the state so far. He further informed that 15 lakh houses have been built in the state during the last 2 years and have been provided to the houseless people. In the next 4 years no one will remain landless. CM Shivraj Singh Chouhan informed that budget allocation as per the population of poor has been ensured for the welfare programmes. A Land Reform Commission has been constituted after the deliberations with various organizations and clear legal provisions have been made to give land rights to women. 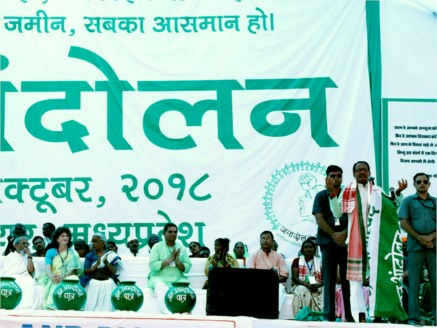 CM Chouhan said that a strong social security has been ensured by the government in the form of Sambal Yojana for each poor and needy people of the state. Under the scheme, full expenses towards education for children of beneficiaries from class 1 to higher education are being borne by the state government. A financial assistance from Rs. 2 to 4 lakhs are being given to these families at the time of crisis. Along with this, free medical treatment and employment opportunities are being made available for poor and needy persons.